Warning: This documentary will only stream until April 27th so act fast! Ever since I saw Amadeus, the fascinating movie about the life of Mozart, I've been interested in learning more about the lives of history's great composers. I've always been intrigued by the geniuses that have changed the world. If you can't be one, at least learn to fake it. Since I'm too lazy to do any actual research on Mozart, Beethoven and the like I just scour Netflix for interesting documentaries. Phil Grabsky is the award winning director of In Search of Mozart, according to Netflix anyway. For some reason Netflix doesn't actually carry In Search of Mozart (even on disc) even though they mention it in the description for this documentary. That annoys me, because while this may not be the most well done documentary I've ever watched, it was still great to learn about the genius of Ludwig van and I would have liked to have done the same with Mozart. Especially considering how closely the story of one impacted the other. Mozart came first and left a big shadow, one that Beethoven strove to overcome for most of his career. He eventually did surpass Mozart (depending on your opinion) and completely revolutionized the way compositions were structured. What's really incredible is that he did most of it while being either partially or completely deaf. Talk about overcoming a disability. It also made him a very dark person. Imagine not even being able to enjoy the creations you slaved away at? That must have been torture, but he kept going, despite being suicidal. 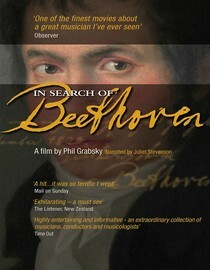 He was a fascinating guy, and while this documentary got a little bogged down at times it is a worthwhile watch just to learn more about the genius of Beethoven. According to Netflix this movie will stop streaming on 4/27/11. Of course, sometimes they lie. Why is it in your queue? I like learning about geniuses. Is it artsy? No, but it is about the life of an intense artist. What stood out the most to you? The contemporary composers they interviewed in this documentary are pretty funny looking people. What mood should I be in to watch this movie? In the mood to hear some great music and learn about how it was created.